UFO Plast states three factors that have been key to their rise as a producer of aftermarket parts and gear for the motocross community: style, choice of materials, and quality. Of course, no one is going to say they make ugly, low-grade equipment, but UFO's dual lens headlight is a true bargain, and their products are up and coming in the U.S. 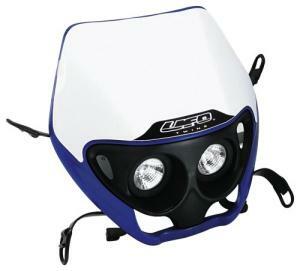 The dual lens headlight has two halogen bulbs housed in a plastic fairing with sturdy strapping for a secure hold. This is a traditional headlight replacement, so it isn't complex to install, and comes in a wide range of colors to match your bike or add an accent. Motocross bikes are off-road creatures, which means you'll probably find yourself riding on dirt roads at night. Without streetlights to help them out, motorists have been known to mistake the twin headlights of bikes for distant cars. Be careful and never trust that someone bombing around on the trails in their car knows how close you are to them. If you follow MX in Europe, you'll see UFO Plast popping up across the board. They're inching into the U.S. market, and I expect we'll soon be seeing more of their products and logos as the economic revival leaves sponsorship opportunities.